USGS, New Mexico - FTS Inc. The Rio Grande flows from Colorado’s snow capped Rocky Mountains and travels almost 2,000 miles to the Gulf of Mexico. 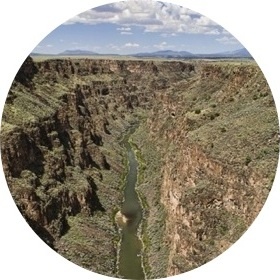 The river passes through 800-foot canyons of the remote Rio Grande Gorge in northern New Mexico. The Bureau of Reclamation is the largest wholesaler of water in the US, providing irrigation water for agricultural use and drinking water for millions of people in the western states. It is working alongside the Army Corps of Engineers to ensure water quality and to maintain flow requirements in to the Rio Grande in the wake of reduced snowpack and the resulting lack of melt water. In New Mexico the USGS is engaged in hydrological research in the vast Rio Grande where they are primarily collecting suspended sediment concentrations. The data is provided to the Bureau of Reclamation and Army Corps of Engineers for a number of various uses including channel morphology, the effect of dam construction or removal, and other wider biological impacts. The USGS are deploying DTS-12 turbidity sensors for their research in the Rio Grande. The sensors are installed in the river channel and are being used to trigger an ISCO autosampler via Axiom DCPs. The DTS-12s monitor a range of turbidity that provides a surrogate for suspended sediment concentrations over time. In addition, water velocity is measured with multiple side-lookers, something that the Axiom H2 makes possible with its multiple independent, high-current SDI-12 ports which support these high power draw, long read time sensors.